The investment banking business has split in two, with two main strategies that banks can choose from to deliver returns for shareholders. First, banks can employ a scale strategy, where they are big enough and in enough business lines that they become key to clients, and are able to generate attractive returns. JPMorgan fits the bill here. Second, they can be a niche player, picking their spots in particular business lines where they have a competitive strength. Swiss bank UBS has had success with this strategy, and “doing a UBS” is now shorthand for slimming down in investment banking. However, some unfortunate banks are stuck between those strategies. The middle ground, where banks have the cost base of a scale player, and the revenues of a niche firm, has come to be known on Wall Street as the “Valley of Death” or “the Killing Fields.” Basically, you don’t want to be there. Macquarie analysts led by Piers Brown touched on this in a big note out on June 10, and said that as many eight firms find themselves in a dreaded “mid-tier” position. 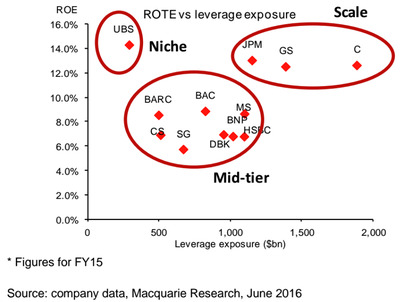 We think many banks have simply not been selective enough and find them caught in unprofitable mid-tier positions across multiple product segments with balance sheets 30-40% smaller than scale peers but 2-3x larger than successful niche players. This applies to most European banks except UBS, as well as to MS and BAC amongst US peers. The note added that further restructuring looks inevitable for the banks in the mid-tier group, a group that includes Credit Suisse and Deutsche Bank, which have already announced measures to slim down, as well as Bank of America and Morgan Stanley. Expect more job cuts, in other words. 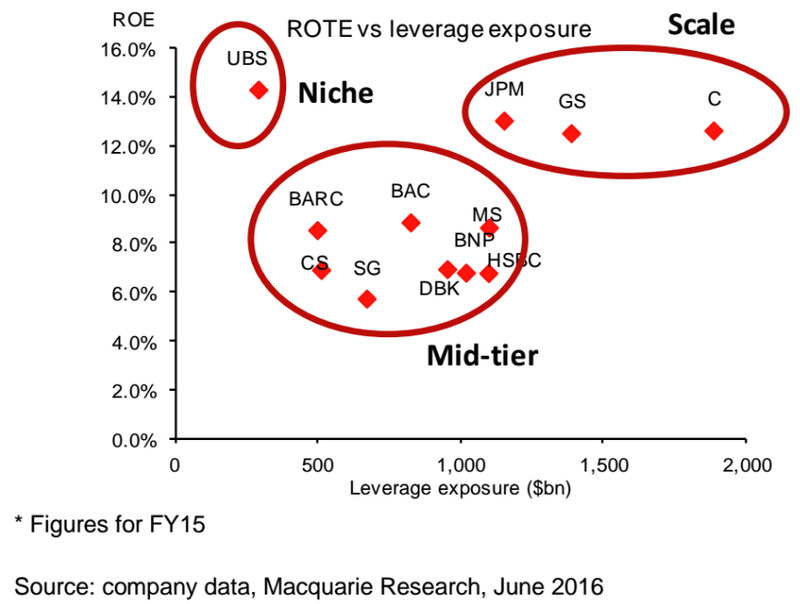 Macquarie‘The Valley of Death’ is the mid-tier group, which have a high leverage exposure but a low return on equity.